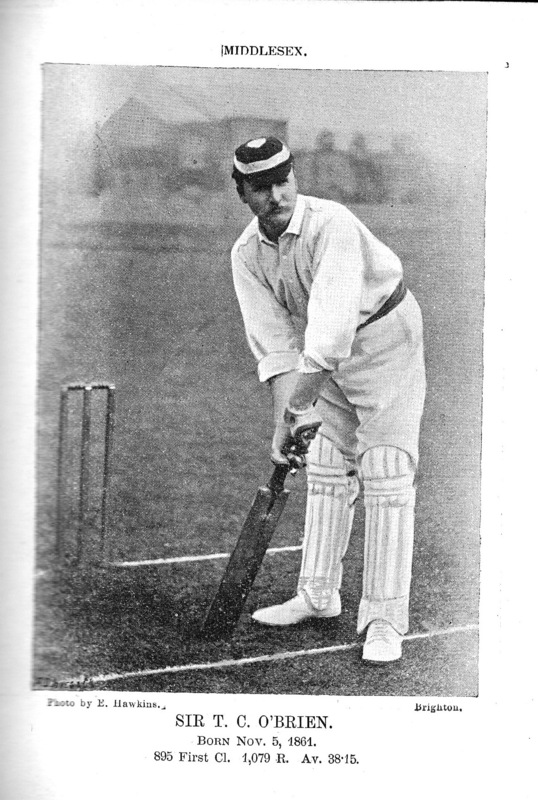 Almost a hundred years before a Middlesex batsman played a dodgy reverse sweep in a World Cup final to an Allan Border roll over another batsman from that county, Sir Timothy “Tim” Carew O’Brien, 3rd Baronet , pioneered the shot. The trusty rusty Type III time machine can take us back to midsummer of the year 1893. Middlesex are playing their old enemy Surreyat Lord’s and the Squire’s good friend Cyril P. Foley is in the side and able to help the time travellers find their way through the north London traffic thanks to his seminal Autumn Foliage. 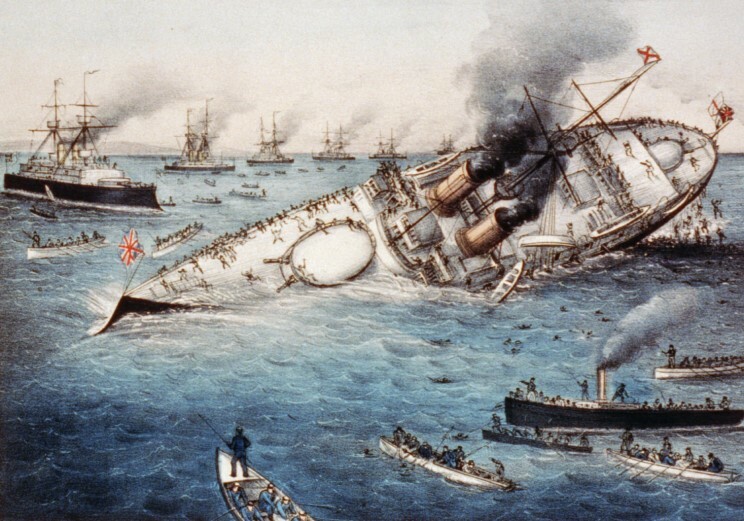 On the match’s first day, the 22nd June, an Empire’s capital is in shock at the news that HMS Victoria has just been rammed by HMS Camperdown as the Mediterranean Fleet, untested since the days of Nelson and now under the command of the appropriately named Sir George Tryon, has attempted the Gridiron evolution with the loss of 358 officers and men (including Sir George) out of a total ship’s company of 718. But there is further bad news for Middlesex next day. Scoring 108 in reply to Surrey’s 287, they are following on 179 in arrears. Then, the game turns on a Victorian silver sixpence. Openers A.E. Stoddart and Sir Tim, also the county’s captain, chase down the deficit in fine style, Foley at Number 4 sustaining a severe case of pad rash. A now desperate Surreycaptain, John Shutter, calls up Walter Read as his seventh bowler. In league, they set a packed on side field for the infamous underarms (108 first class wickets for 32.25 apiece) temptingly lobed down a leg stump line from the Nursery End. Sir Tim, noting the total absence of spin, turns completely round and drives the ball with terrific force up against the new pavilion rails, wicket keeper Wood taking refuge in the slips and the crowd roaring with laughter. Having hit four fours in this manner, Sir Tim, attempting a fifth, misses the ball as his bat smites the ground with a terrifying blow, raising a cloud of dust as the ball balloons into his pad. When the dust settles, the off-bail is observed to be lying on the ground. ‘A perfect pandemonium ensues,’ recounts Foley at countless dinners to come from Cape Town to Cairo. Wood from somewhere behind first slip claims that the batsman has trodden on his wicket. Sir Tim wonders how Wood can be so sure when, at the critical moment, he was running away from the scene of the action and submits a counter claim that Wood has knocked off the bail himself. Now Read adds to the cacophony declaring above the racket that he has clean bowled the 3rd Baronet. So, this is cricket in the Golden Age, symbolised not so much by good sportsmanship and the spirit of cricket as by the fact that it occurs to none of the principals to refer the matter to the umpires. When at last Read does so, Coward (you couldn’t make it up) and Smith protest that their views were obscured, one by the bowler the other by the batsman. Foley will later tell how the game ‘resumed in a somewhat strained atmosphere’; Middlesex batting into Day Three to set a target of 199, and dismissing Surrey for 119 to win by 79 runs. The temperature in the pavilion bar at the end of day two must have been on the cool side for a June evening. As for Sir Tim it was just the beginning of his innovations … but the Type III must make its way to Clifton where W.G. and Gloucestershire await for the perfection of a shot that then as now divides opinions, perplexes umpires and raises voices on and off the field. If you go down to your club today you’ll be sure of a big surprise. Bats have been swapped for brooms, balls for paint pots and flannels* for overalls … well you get the idea. Third Man will be there as his local organiser has done a deal with the nearby chippy, who has bravely agreed to provide a fish supper** for anyone volunteering to join the NatWest Cricket Force action weekend. Over 130 under 11s attend cricket practice there on Thursday evenings. Sang Lee (for it is he and his wife) may need some biblical techniques if he is to keep up supplies. Nat West is now almost (80%) entirely owned by ‘us’. It’s OUR bank and its doing its bit for OUR clubs and over 1,5o0 clubs have already signed up to take part in the event. If any one else higher up at the ECB had asked Third Man to get down to the ground he might just have shrugged, but Dave is a special person. He typifies everything that’s good about Lancastrian cricket. He expects the highest standards but leads by example. He sells his wicket dear but knows the value of the game. ‘Nough said. *Flannels are to creams, whites, trackies as wireless sets are to radios, walkmen and MP3 players. As you see from the above banner, in the ‘70s – that’s the 1770s – we favoured a more relaxed dress code on the field. **Diet is an increasingly important part of the modern game, in recognition of which, ECB has appointed blogger Mike Gatting as Managing Director Cricket Partnerships.